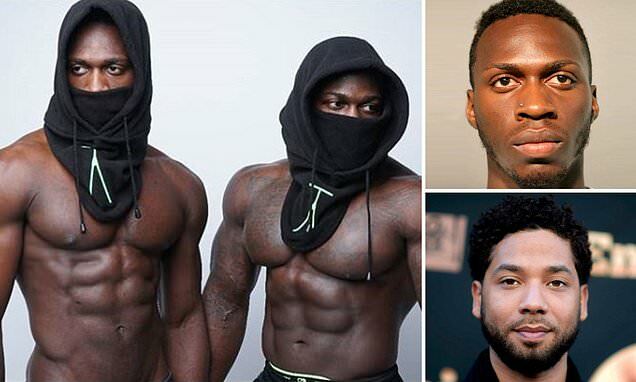 One of the men arrested by Chicago police in connection with the attack on Empire star Jussie Smollett has previously been convicted on assault charges, DailyMail.com can disclose. Olabinjo Osundairo, 27, was sentenced to two years’ probation and fined $674 in September 2012 after pleading guilty to a single count of aggravated battery in a public place. Bodybuilder Osundairo was originally charged with attempted murder, two counts of aggravated battery causing great bodily harm, one of aggravated battery with an air rifle, two of aggravated battery in a public place and one of unlawful restraint. All charges except one of aggravated battery were thrown out, according to a disposition document obtained exclusively by DailyMail.com. Younger brother Abimbola, 25, is also no stranger to the law and was booked on DUI and speeding charges in July 2015 according to Chicago arrest records. The Osundairo brothers were collared on Wednesday night at Chicago O’Hare airport, as they returned from a trip to visit family in Nigeria. Their shared apartment was also raided by police, who took away bottles of bleach and a pair of Nike shoes. Although the property is shared with other family members, there was no answer when DailyMail.com visited the home earlier today – although evidence of the police raid could be seen in the badly dented door. The two men had flown to Africa the day after the January 29 attack on Smollett which took place close to his apartment building on East Water Street. Smollett, 36, initially said the attack appeared to be racially motivated and claimed his assailants shouted ‘this is MAGA-land’ as they punched and kicked him.